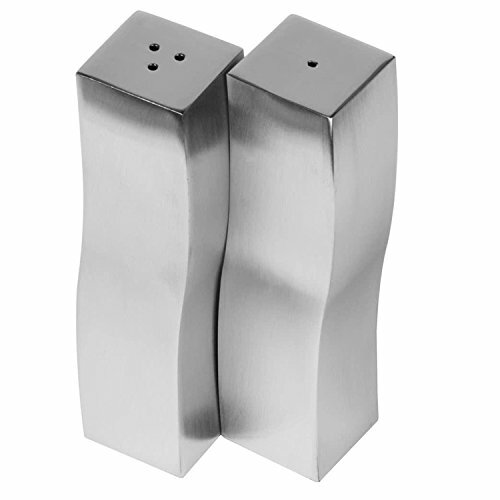 SET of 2 MODERN SALT AND PEPPER SHAKERS: These shakers are perfect for foodservices, restaurants, cafeterias, bars, pubs, and dining halls that are going for a more contemporary look. Made with durable stainless steel, the shakers boast a satin finish and are designed for years of everyday use. STYLISH: Dispense salt and pepper in style with these state-of-the-art shakers. Measuring 1"L x 4"H, each unit holds up to 4 ounces. And you don't necessarily have to use these large shakers for salt or pepper. They can also hold garlic powder, onion powder, Himalayan salt, turmeric, sugar, and much more. UNIQUE DESIGN: While their shapes are not quite traditional, the elegant shakers are simple to grasp. They fit together perfectly to form a sleek oval when they're not in use. Unlike salt and pepper shakers that are made of ceramic, glass or plastic, the metal shakers in this set are not prone to breaking. FOR HOME OR COMMERCIAL USE: This set of salt and pepper shakers does just as well in home dining rooms as it does on restaurant tables. Especially great for locations that strive for a modern style, the shakers make it easy to dispense just the right amount of salt or pepper. TRUSTED MANUFACTURER: Culinary Depot is a reliable manufacturer that's known for its wide selection of kitchen and hospitality products. Supplying both commercial and residential items, Culinary Depot offers everything from kitchen utensils to food preparation supplies.